My suggestion would be to use "checkbox" question instead of dropdown if you need users to select multiple options. If you have too many options or if you really need to use the dropdown for some reason, then you can also make the dropdown larger so that users can select multiple options from it. 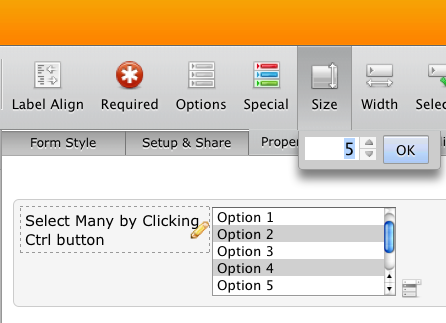 To do that, click on the dropdown question and then click on the "Size" button on the toolbar. Then increase it to something like "5". Thank you for your response and assistance! where my form is in use with the dropdown as you suggested. Why is there a gap at the top of the options? Can I get rid of it? No, you can't. I added this to our bug list.